Sufficient sleep is fundamental to your body’s overall health. You need air and water. You need food. You also need sleep just as much. It is imperative that your brain and body have the time they require to re-boot every single morning. Your body, especially your heart, gathers stress as your day goes on. When you finally begin to rest at night, your heart slows and has an opportunity to decompress, relieving those stresses it accumulated. Then it can recoup and rebuild enough energy to tackle another day. In sleep, your brain and body get revitalized. This allows your blood pressure to decrease and slows the pace of age-related diseases. Illnesses such as obesity, hypertension, memory loss, and even diabetes can be curbed. Lack of sleep places a burden your heart with excessive strain and stress on the muscle. Heart attacks, stroke, cardiovascular disease, and – in severe circumstances – death have all been connected to sleep disorders. Often, snoring is a symptom or alert of a more critical health concern known as sleep apnea. When you have sleep apnea, you experience an obstruction in your airway. You may not even realize it’s happening! The obstruction prevents oxygen from being properly processed throughout the night. 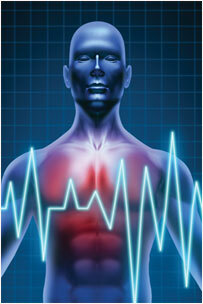 Sleep apnea has been determined to be a major contributing factor to heart disease. Those suffering from sleep apnea experience elevated blood pressure, which is a key risk factor for both heart disease and stroke. Sleep loss can result in serious health concerns and even premature death. Sleep deprivation can have negative effects on the function of your brain, increasing stress hormones and leading to depression. Even if you have only mild sleep apnea, being fitted with an oral appliance can result in the reduction or even cessation of snoring. This could be a great gift to your partner and yourself! 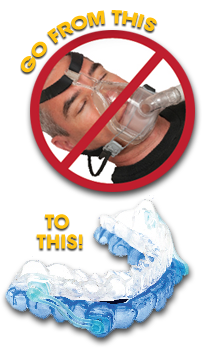 The CPAP (Continuous Positive Air Pressure) device has been the traditional treatment for sleep apnea and remains the gold standard for moderate to severe sleep apnea. The patient is fitted with a mask connecting via tubing to a machine that pumps a continuous stream of air into their nose or mouth while they sleep. However, many people find this uncomfortable and stop wearing the mask. If you have been diagnosed with mild to moderate sleep apnea and are frustrated with or can’t tolerate or your CPAP, we can offer you an alternative treatment. Dr. Sheron can custom fit you with an oral appliance. These are small acrylic, nylon, or plastic devices that fit over the upper and lower teeth much the way an orthodontic retainer or mouthguard does. The appliance gently realigns your tongue and jaw to open your airway, which allows increased air flow to the lungs as you sleep. These small devices are easy to place and remove, easy to clean, and convenient for travel. Most patients find them amazingly comfortable, and they have an excellent success rate for the treatment of sleep apnea and snoring. Snoring and sleep apnea don’t have to fill your nights. Give us a call today at (360) 356-7096 for a no-cost/no-obligation consultation.